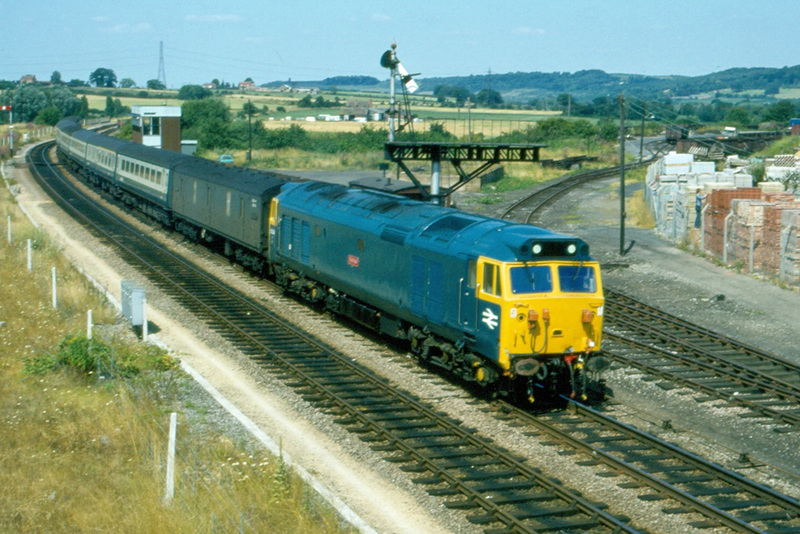 Fifty locomotives (50) (Nos.D400 to D449) of class 50 were built by English Electric Ltd at Vulcan Foundry, Newton-le-Willows, Lancashire during 1967-8. The locomotives were leased to British Railways and were purchased in 1973. The locomotives weighed 115 tons and were fitted with an English Electric 2,700hp diesel engine. The locomotives were used to haul services on the West Coast Main Line north of Crewe. In February 1972 No.D400 was transferred to the Western Region and the rest eventually followed. They later became Nos.50001 to 50050. In Worcester the class took over the running of the express passenger services from London to Worcester and Hereford. 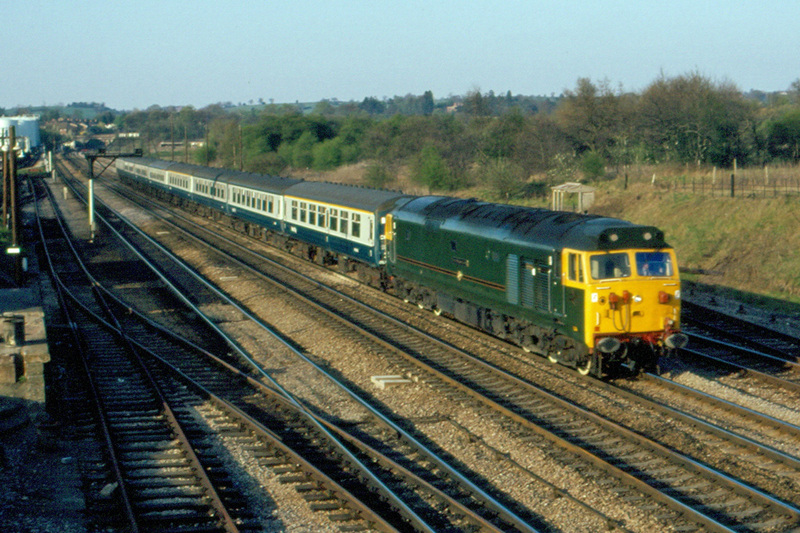 The Western Region named the locomotives after Royal Navy ships, thus carrying on the tradition following the demise of the class 42/43 diesel hydraulic locomotives. In 1984, No.50007 was renamed to 'Sir Edward Elgar'. 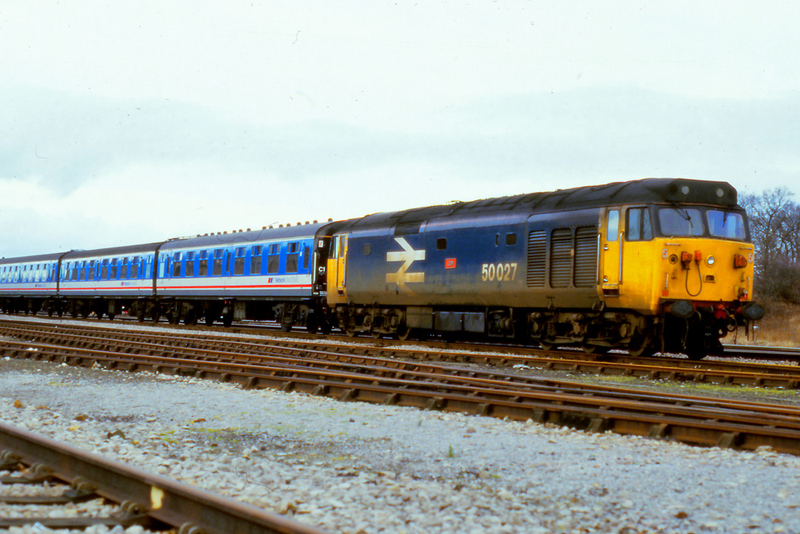 Withdrawal of the class 50s started in 1987 and the class became extinct in 1994. In January 1976, Robert Cooke photographed class 50 diesel locomotive No.50047 together with a class 31 diesel locomotive in the shed yard at Worcester. 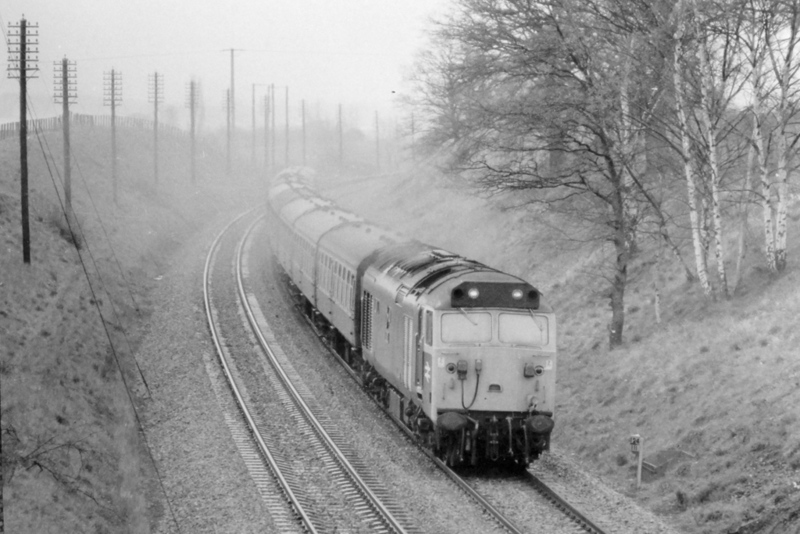 On 25th April 1978, at Salwarpe near Droitwich Spa, Adrian Booth photographed class 50 diesel locomotive No.50035 'Ark Royal' which was in charge of an excursion train. Note the forest of telegraph poles on the embankment. Class 50 diesel locomotive No.50034 'Furious' passing the signal box on the approach to its next stop at Evesham Station with the 11:46 Worcester Shrub Hill to Paddington on 1st August 1981. Several Royal Navy warships have carried the name 'Furious', most recently it was used for an Aircraft Carrier which saw extensive use during World War 2. Photograph taken by Robert Cooke. No.50007 'Sir Edward Elgar' in Brunswick Green livery passes Bromsgrove with an Inter-City express on 26th April 1984. The train is probably the afternoon Manchester to Plymouth service and the class 50 diesel locomotive would have taken over from an electric locomotive at Birmingham New Street Station. Starting in 1978 the class 50s were refurbished at Doncaster Works including the fitting of a headlight in the centre of the cab. Photograph taken by Robert Cooke. On 8th February 1987 class 50 diesel locomotive No.50037 'Illustrious' in Network SouthEast livery was photographed by Pete Wilcox at Worcester Shrub Hill. When these locomotives were paired with carriages in similar livery the effect was quite striking. 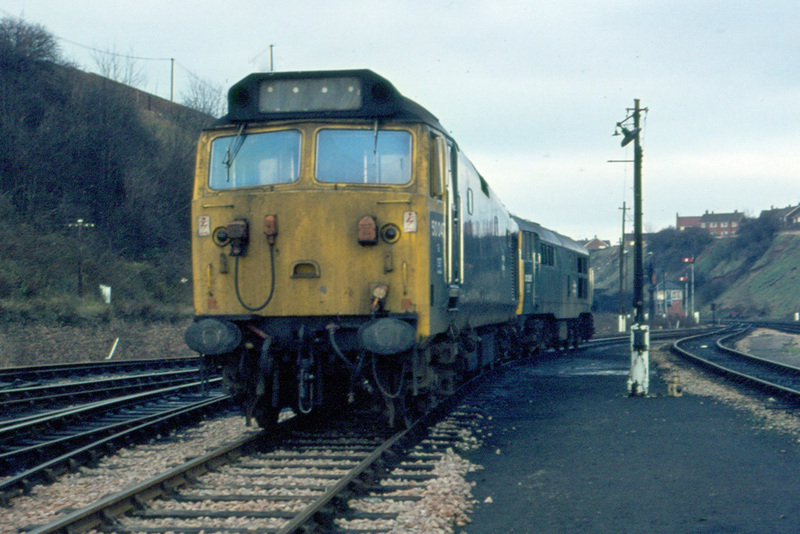 The addition of a headlight in the centre of the yellow front-end panel indicated that this locomotives had been through Doncaster Works for refurbishment. Class 50 diesel locomotive No.50027 'Lion' at Worcester Shrub Hill on 8th February 1987. No.50027 survived in BR service until July 1991 after which time it was purchased for preservation. 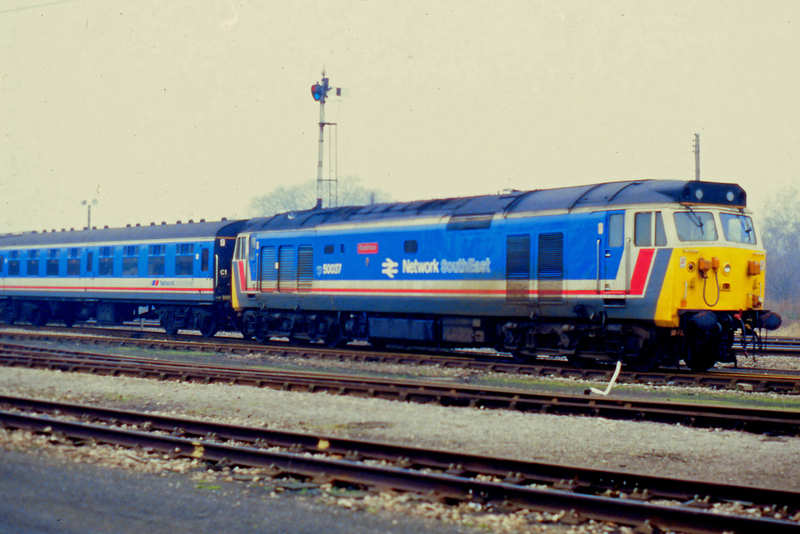 The locomotive, which had already been through Doncaster Works for refurbishment, is in a revised blue livery with large numbers and full height BR logos, however soon after this photograph was taken the locomotive was repainted into the same livery as the carriages. The photograph was taken by Pete Wilcox.